Recreation, Fish & Wildlife students at Selkirk College get the opportunity to take their classroom learning out into the community. 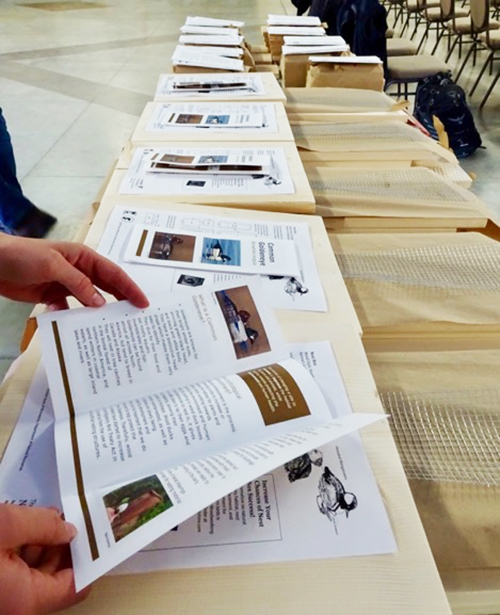 Recently, students worked with Friends of Kootenay Lake Stewardship Society to share information on local birds and the impact building simple nesting boxes can have. As a student of the environmental sciences, I often have members of the public approach me and ask what I am working on. I generally enjoy these interactions, as I get to share a little of what I am passionate about with a stranger. However, when I answered that I was working on an ecosystems enhancement project I received a response I was not prepared for: Why? Why work on a project designed to enhance ecosystems which are not currently struggling? And specifically, why worry about a species that is doing relatively well in British Columbia? The Barrows Goldeneye is not currently considered to be a species at risk, and is relatively plentiful through the western portions of Canada and north western United States (All about birds 2017). I have to admit, I was a little taken aback. Nevertheless, the encounter made me think about my project in a new way. The exciting thing about ecosystem enhancement projects, is that they are a proactive measure rather than a reactive one. So often we as citizens realize a species is at risk due to habitat destruction, climate change, introduced predators or other compounding factors well after the ideal moment for action has passed. Ecosystem enhancement projects create an environment where problems can be addressed before they become problems. Take this project as an example. The barrows goldeneye is a migratory duck found throughout Western Canada and the North Western United States. It feeds on aquatic invertebrates and nests in cavities (All about birds 2017). Though not at risk in B.C., the barrows goldeneye is considered to be a species of special concern in Eastern Canada (Species at Risk Public Registry 2018). This means that though it is plentiful here, its numbers are dwindling in other regions. Construction of nest boxes allows us to better monitor and understand the barrows goldeneye in a location where it is doing well. We can make mistakes and see what sort of nest box it prefers, and what locations work best. After a period of trial and error, we can then take that information and translate it to east where the population needs support. Additionally, through use of nest boxes new habitat is created in cities and developed properties which may have previously been nesting grounds prior to urbanization. Putting nest boxes in areas accessible to the public, but far away enough that the animals still feel safe, provides viewing opportunities and the change for continued public education. It also provides a great place to take children, school groups and friends to learn more about an interesting duck in this area. If you would like to participate in an ecosystem enhancement project visit this link to find out what is currently underway. Or, if you want to check out the nest boxes specifically you can find more information here. Ecosystem enhancement is a fun, educational and hands on way to discover new aspects of your community. Specifically, this project has taught me the importance of working on projects proactively and has shown me how enjoyable it can be when a community comes together to work towards a common goal. If you build it, they will come. An old saying, sure, but a central idea to a student-taught workshop all about constructing bird houses, or nest boxes, for Nelson’s migratory birds. Hosted at the Nelson Rod and Gun Club last Monday, Recreation, Fish and Wildlife students from Selkirk College, in collaboration with Friends of Kootenay Lake Stewardship Society (FOKL), presented information on two local birds and demonstrated how easy it is to contribute to their habitat by building simple nest boxes. Two species covered in the workshop include the Barrow’s goldeneye (Bucephala islandica) and tree swallow (Tachycineta bicolor), presented by Allison and Rhia. Both students spoke to the physiology of these species and segued into habitat enhancement strategies for each. What I and other members of the public learned were that these birds complete a continental-sized migration north from warmer, southern lakes and coastal waters of North America to higher latitudes, returning to the same breeding sites every year. Ideal habitat and breeding sites for both birds are adjacent to bodies of freshwater like wetlands, marshes, and, of course, the pristine shores of Kootenay Lake. Once at their familiar mating sites, females of both species find nests in natural cavities of standing dead wood or old woodpecker cavities. Unfortunately, both species are in population declines in North America because of habitat loss or degradation. There is hope to remedy the trend, though, as goldeneyes and sparrows will happily nest in man-made nest boxes. When prompted by Allison why we’d want to pursue habitat enhancement as a management strategy, one child shouted enthusiastically “To make it better for animals!”, while another gentleman in the front row neatly added “Because we all live here.” By constructing nest boxes near bodies of water, Allison continued, we can improve the availability of habitat, thus enhancing its potential for use. Equipped with an deeper understanding of these local birds and habitat enhancement, Darryl, Erin, and Bret demonstrate just how easy it is to assemble your own nest boxes for Barrow’s goldeneyes and tree sparrows. Placement is the key here, as they must be placed close enough to forage and nesting materials to entice birds into your nest box, while high enough to discourage opportunistic scavengers. Cleaning these boxes come fall is as important as building and placing them correctly, Daryl stresses, because boxes filled with used materials discourage further use and even deters potential occupants as they scout nests for next year while migrating south. Delivering public outreach and science communication like this isn’t just valuable to ornithologists and casual birders. Through educating the public, Selkirk students are exercising a powerful tool by generating community interest in a framework for habitat enhancement. FOKL’s Duck Bay Project, for example, began as a volunteer effort to improve the appearance and public usability of Nelson’s lakefront greenspace. Since then, it has evolved into an active habitat enhancement project relying on a variety of funders, conservation organizations, local professionals and countless volunteers. At the very least, Selkirk’s students were able to influence community capacity building with tangible benefits to wildlife habitat; and, optimistically, provoked individual interest and action toward closer relationships with the land and improved environmental stewardship. Learn more about Recreation, Fish & Wildlife and follow Environment and Geomatics on Facebook. All About Birds: Barrows Golden Eye: 2017. Ithaca, New York: Cornell University; [cited Oct 18 2018]. Spices at Risk Public Registry: Management Plan for Barrows Goldeneye. 2018. N.P. Government of Canada; [cited Cot 18 2018].